The creators of the enjoyable open-world Infamous games nto their super-hero cities. They've done it before, and, hey, we like when developers make jokes. 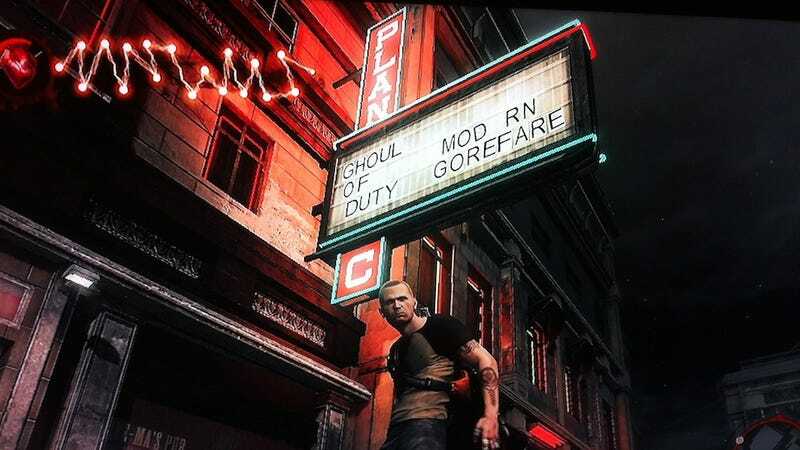 So cheers to the Infamous development studio Sucker Punch for taking a gentle jab at Call of Duty: Modern Warfare in this week's downloadable PlayStation 3 vampire adventure, Infamous: Festival of Blood. I don't see any Battlefield jokes to balance things out, but I'm sure, if they're in there, someone will tell me. The proper way to play Festival of Blood, I should note, isn't to gawk at the signs. It's to bite civilians.